Garmin GPS 73 International is portable GPS Navigator which related to Garmin "Marine Series". The Garmin GPS 73 is an affordable model with a black-and-white LCD display, which is equipped with a number of additional functions for water sport. The Garmin Company, a world leader in the field of GPS navigation, has announced a new portable waterproof navigator Garmin GPS 73 International. The GPS 73 navigator is perfect for owners of motor boats, sailing yachts and small boats for fishing and water sport. Garmin GPS 73 International has received a number of characteristic features of marine devices, including "Man overboard", alarm system and the "Sail Assist" function which provides information such as the virtual start line, timer, distance to the start line, the velocity graph and the optimal direction angle. Garmin GPS 73 International has a reduced size and weight compared to its predecessors, due to which Garmin navigator GPS 73 has a better grip and it is much easier to hold in your hand. The expantion of the internal memory allows Garmin GPS 73 to record up to 1000 way points on the route and 10 thousand points for 100 tracks with maximum details as posible. 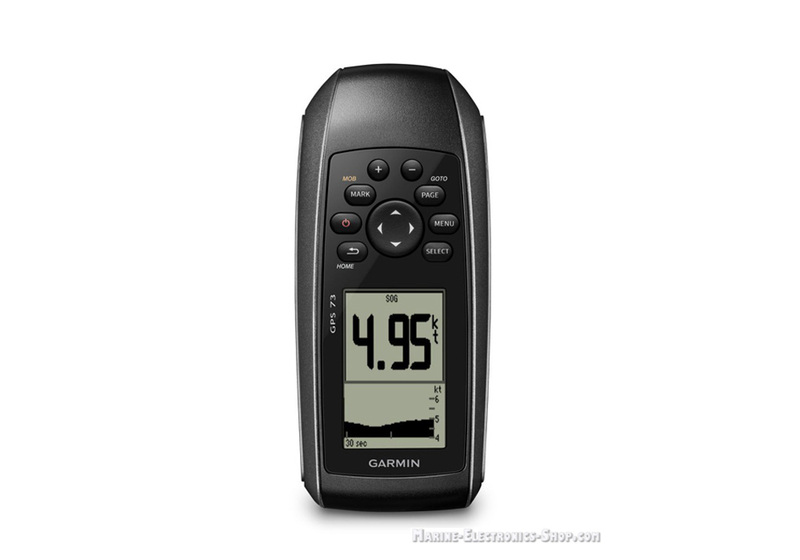 Garmin GPS 73 International has a waterproof sealed construction and positive buoyancy. Due to which Garmin GPS 73 navigator does not sink and it is easy to catch if immersed in water. Monochrome display of the navigator Garmin GPS 73 International saves battery power due to less consumption for color reproduction. Traditionally, for such devices, GPS-navigator Garmin GPS 73 International is equipped with the functions of international display of tides and solunar charts, position of the Sun and the Moon calendar optimal hunting and fishing for a specific origin. The acoustic alarm of Garmin GPS 73 will warn you about the demolition of the anchor, approaching a dangerous point and entering a shallow or deep water. The Garmin navigator GPS 73 International will notify you about the upcoming turn and also if you are getting off the original course. Also, the Garmin GPS 73 is equipped with a function of "man overboard", which provides immediate fixation of the accident place coordinates and operational directions to the accident point. The function “Sail Assist”, which is included in Garmin GPS 73 International, is made to give a competitive advantage to a small boats which take part in races. The small yachts which are usually not equipped with full-featured chart plotters, may use the Garmin GPS 73 “Sail Assist” function for accurate record the position of the launch site in form of a virtual line and calculate the distance to it, track schedule rates, use countdown timer and stopwatch during the race, determine the most appropriate tack and turning point when maneuvering, etc. Garmin navigator GPS 73 owner may use the USB interface in order to export the data or download maps from a PC. In addition, Garmin GPS 73 International has a separate four-connector for power supply and data exchange NMEA 0183. In this way it is possible to connect the Garmin GPS 73 with a sonar depth gauge, autopilot vessel, beacon receiver, etc. Designed as a solution for sea traveling, Garmin GPS 73 International may be also used by hikers, hunters and fishermen. Click the button below to add the Garmin GPS 73 International (010-01504-00) to your wish list.